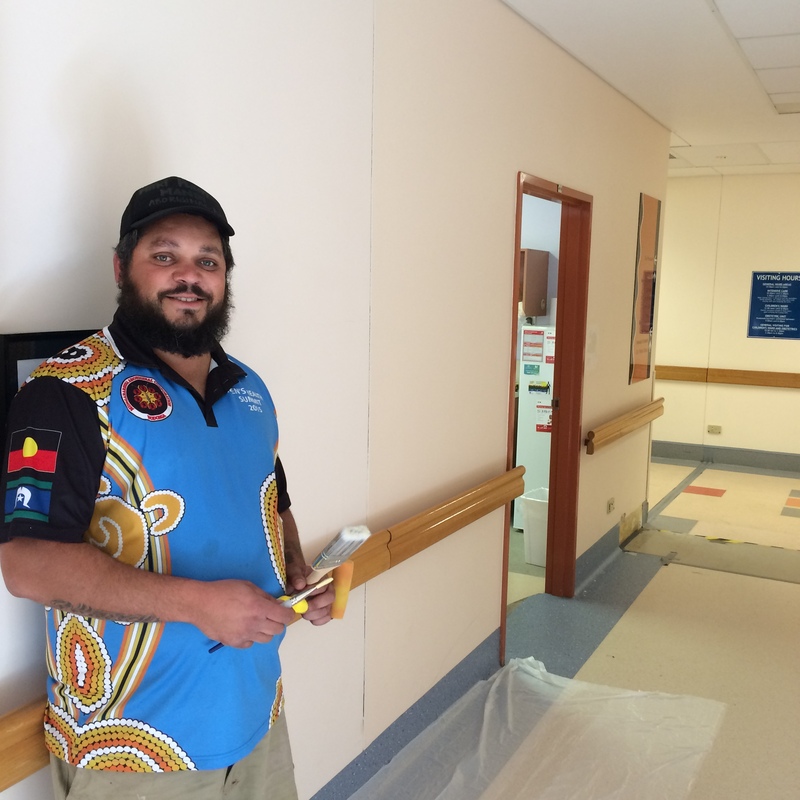 A new mural to feature at the Aboriginal Community Room in the Broken Hill Hospital will help identify the room as an accessible and safe space for Aboriginal community members when using the health service. 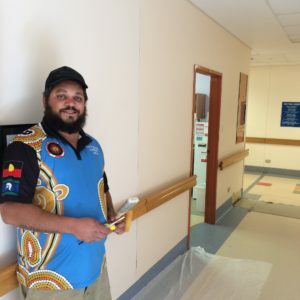 The mural is being painted by Aboriginal artist Corey Payne and will feature the nine facilities that make up the Far West Local Health District. It will be officially ‘opened’ on 4 July 2017 as part of the health services contribution to local NAIDOC Week celebrations. Ms Haley King, Aboriginal Liaison Officer, Broken Hill Health Service, said the traditional Aboriginal artwork featured in the mural aims to ensure connectedness for our Aboriginal patients and families accessing the health care facility. “We want our families to feel a connection with our culture and provide a place of some comfort and have a safe area to access during times of worry, stress and sorrow,” said Ms King. The mural will also provide non-Aboriginal staff with a point of reference in directing Aboriginal community members to the community room as it will have more visibility within the health service. The artist, Corey Payne, is a proud descendant of the Paakantyi and Wilyakali tribes of the far west NSW area. He was born in Broken Hill and has fond memories of his childhood here until he relocated to Mildura at 17 to complete school. Mr Payne said creating the mural will for him personally be a way to thank the staff of the hospital who assisted his family during a time of much loss and grief, when his eldest sister (32) passed away in the hospital from a stroke. Mr Payne said he was very excited to be asked to paint the mural on the walls of the Aboriginal Community Room. “I believe it will not only look absolutely beautiful, but it will make all people who visit it, feel at peace, and comfortable, while also seeing that the work has been done by a local Aboriginal man whom is a traditional custodian and descendant of the local tribes. “Also, it will provide another avenue for my unique works to be shared to many sets of eyes, which my Aboriginal art businesses name represents in Paakantyi – Miiki Puuri Mandi – ‘For your eyes and spirit’. Perhaps some youth may see that there is something we can do as adults that is positive, and can make a living from,” said Mr Payne. The mural was funded as a Far West LHD Arts in Wellbeing project. Artist Corey Payne at the Aboriginal Community Room in the BH Hospital about to start his mural.